These cities in Colorado are known for rapid beauty and natural surroundings, that you and your dog will surely enjoy. Denver has been rated to have the best parks and trails for 2009, and dogs are often welcome. This off-leash park has been voted best dog park in Denver. The park is both clean and secure, and offers hydrants and waste bags. The greater park itself offers picnic areas, and hiking and biking trails. Earth Dog Denver is a resort for dogs, which includes daycare, grooming, kennels and training. There are mountains and a huge dog swimming pool. They offer organic dog food and hold events. Their off-leash dog park is open to the public for $5/day. This off-leash area is not fenced in, so make sure your dog knows not to stray off. Be careful, because there are thorns and cacti around the premises! 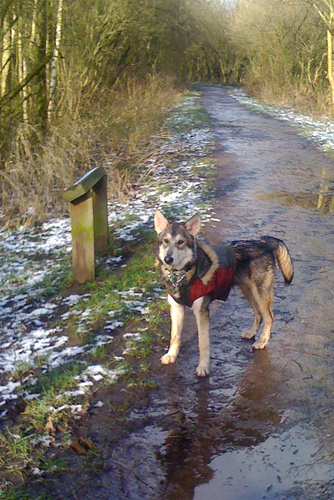 This fenced-in, off-leash park is centrally located and surrounded by beautiful scenery of a mountainous backdrop. It is a big grass field, but be aware that there are no benches. Open dusk to dawn, seven days a week. This is an off-leash park located close to downtown Denver, so you can enjoy a nice view of the skyline against the mountains. There are also bathrooms and a picnic area. Click here for a map of dog parks in Denver. This is a walking path and there are two small ponds for swimming. It is for well-behaved dogs who will not harass the wild prairie dogs on the premises. There are beautiful cliffs, hay fields and croplands on the premises. This park has an open space for dogs to roam, along with two ponds. The Dry Creek Trail is one mile through the grasslands, and dogs are common here, but must be leashed. This two-acre fenced park comes with separate entrances for big and small dogs, where they can roam off-leash. This is a fenced area for both large and small dogs, and runs as a temporary dog park until the Valmont City Park is completed. There is a water spigot that is available seasonally. 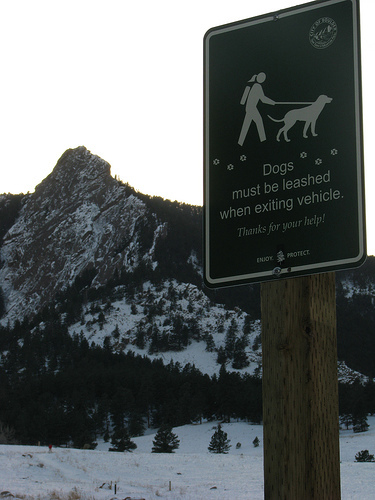 Click here to view the rules on dog walking in Boulder.